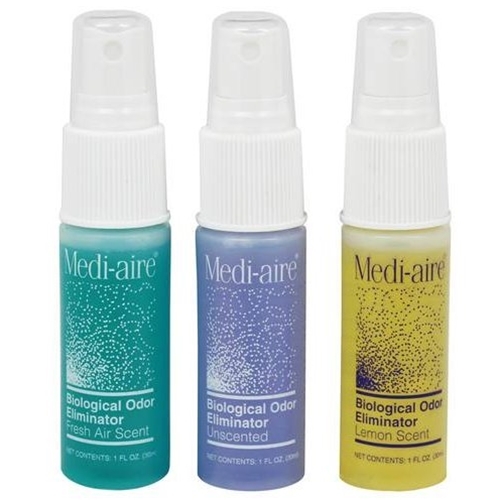 Bard Medi-Aire Biological Odor Eliminator from HealthyKin.com is a unique concentrated formula that chemically eliminates odors associated with urine, feces, emesis and necrotic tissue. The product itself is excellent, but the shipping makes it really unaffordable especially when they charge for each item even when purchasing together. My items were also shipped separately which was a huge waste! Additionally, it would be good to have a refill option (gallon maybe) that is more affordable for company use. Seems to work really well. Bought the refills and put into my own spray bottle. A couples prays is all it takes. Would recommend it to other ostomates. Outstanding product. Doesn't "cover up" odors of biological origin--it eliminates them. Great Spray! Works excellent to cover up unwanted odors! Highly recommend Lemon scent, if you love lemons, this is the scent for you! Wish they had a bigger size. Works great with just one or two sprays. Be careful not to spray too much or the scent can be overwhelming. We have used both the Lemon and Fresh scents. Highly recommended. i have been using this unscented spray for a couple of years and it is the best. much better than anything you buy over the counter!!!!! Works great. Fast and lasting. Shipping is steep though. Wonderful product. Scent is not over powering and it just takes a couple of sprays to do the job. I've tried all 3 scents and the unscented is by far the best. It is hardly noticeable while eliminating any unpleasant odors! The lemon and fresh scent leave a slight after smell but also work as intended. Great stuff! Usually, when a product sounds too good to be true, it's not. But, in this case, it IS! This stuff is AMAZING! It really DOES work! I did find, though, that you need to make a sweeping gesture with your hand while you pump the bottle so the product will disperse over a larger area (over the toilet, for example, from standing height), and that it also takes at least two pumps. But the latter could be caused by the small bottle's pumping ability; perhaps the larger bottle's pump is stronger and puts out more product. I bought the unscented variety because I wanted to see if it really eiminated odor or just covered it up with perfume. The small bottle is ideal for travel; next time I'm ordering the larger bottle.